January 16th, 2010 by KTU | Filed under Notes on Approaches. Myth 2: Finishes derived (recently…not prehistorically) from plants (e.g., tung oil, linseed oil) are less hazardous, more environmentally friendly, and/or less “plastic-y” than finishes derived from petroleum feedstocks (e.g., most urethanes and acrylics). Folks, all of these finishes are polymers, meaning they are comprised of long strings of carbon and hydrogen atoms, usually with some oxygen atoms thrown in. Most of these finishes (except for water-born acrylics) are suspended in an organic (i.e., carbon-based) solvent of some kind. The ones derived from plants smell at least as nasty and emit at least as many volatile organic compounds (VOCs) as the ones derived from petroleum. Of course, most carbon came from plants at some point in the past…which is why I distinguish between “recent” conversion from plants that grew a few years ago and conversion on a geologic timescale (e.g., petroleum). I am willing to bet that if one were to do an environmental lifecycle analysis of a quart of conventional petroleum-based urethane wood finish and compare it to a quart of some exotic tung-oil-based finish, the urethane would probably come out ahead. Why? Because it is made from materials that were extracted very, very efficiently, made in a very efficient factory, and transported to your workplace very efficiently. The environmental footprint of the original feedstock from which the finish was made is probably pretty much irrelevant. Consider that roughly speaking a gallon of petroleum can make somewhat less than a gallon of wood finish and somewhat less than a gallon of gasoline. Your drive to Home Depot and back to buy the wood finish therefore probably consumed more petroleum than was used to make the finish itself. 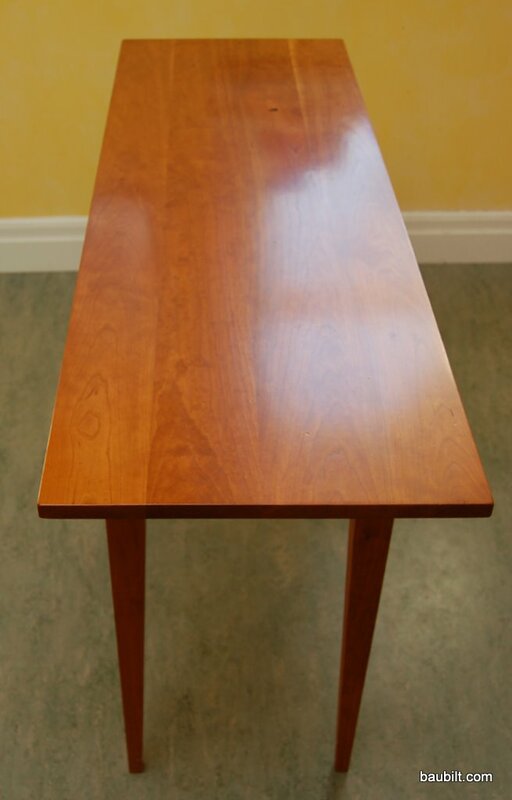 With those rants out of the way, what have I learned about the most obvious wood finishing options? First, the most important variable in determining finish quality is your care and patience. Basically, to get a great finish, you need to start with wood that is sanded very smooth (with at least 220 grit sandpaper). You must also apply thin coats of your finish, let them dry thoroughly between coats, and sand with very fine paper/pads between coats. Realistically it takes two days of elapsed time to put even a basic finish on wood, even with a “fast drying” acrylic finish. The key really is good prep and sanding between coats. Your first coat of finish is hopefully penetrating the surface of the wood somewhat and forming a composite layer of cellulose and the polymer that develops when the finish dries. You are then going to sand that layer to be very smooth using 220 grit or finer sandpaper. (I like to use a green abrasive pad, then a gray pad.) Once you’ve done this, you’ve created the substrate on which you are going to apply the actual layers of protective coating. Another way finishes can go wrong is to sand in the same room as you apply the finish…you’ll get dust on the sticky surface. This is really only a big deal on the final top coat, as you are going to sand between each layer anyway. (You should just wait a few hours for the dust to settle before applying the final coat.) There are many specialized “sealers” or “sanding sealers” that are recommended by manufacturers for the first coat. In most cases these are essentially just thinned versions of what you are going to apply later. Many finishes are thin enough that they work fine as sealers so you don’t need to use a special product for the first coat. In an ideal world you would apply several layers of the protective top coat with a HVLP (high-volume low pressure) sprayer. This gives you a nice fine gentle mist of finish on the surface, avoiding brush marks. But, this method involves way too much gear and clean up for me. That’s why I like the wipe-on finishes. They give similar results without the fuss. Minwax Fast-Drying Urethane (available in different sheens) – I like the appearance (darkens wood more than acrylics). Dries fairly fast (still requires a couple of hours more than the Polycrylic). This is a brush-on formulation, but has nice low viscosity so goes on nicely. It is an “oil-based” formulation so requires solvents (e.g., turpentine) for brush clean up. Minwax Wipe-On Polyurethane (available in different sheens) – I like this finish a lot. You can use a rag or a brush followed by a rag to rub this in. It is low viscosity, so seems to penetrate wood very well. The satin version is pretty much indistinguishable from a tung-oil finish in appearance. I wish Minwax had a better can, though…seems like a squeeze bottle of some kind would be ideal. Watco Danish Oil Finish – basically a hardening oil finish. Easy to apply. Darkens the wood somewhat, which does enhance appearance. I’ve used this on my workshop butcherblock counters and it’s been fine. It doesn’t seem to persist as a finish indefinitely and I’m not sure why. That is, the surfaces seem to “dry out” after a few years. This has not been a problem with the Sutherland and Welles tung oil finish (below). I’ve read that Watco has had several owners and that the formulations have changed over the years. Sutherland and Welles Polymerized Tung Oil – a hardening oil finish made from polymerized (i.e., partially cooked) tung oil and a solvent. This is a pretty good oil finish. It does stink. It must be applied in very thin layers (wipe on and then rub off) or the tung oil will not dry in a reasonable amount of time. (Basically, the partially polymerized oil oxidizes and the polymerization is completed causing the oil to harden into a solid…yes, a plastic. This polymerization is inhibited if the layer of oil is too thick.) This finish is expensive and has limited distribution. I understand this stuff is mixed in 8 gallon batches in a shop in Brooklyn…I like the small-business aspect of this finish, and it is the best tung oil finish I’ve tried. But, honestly I like the Minwax wipe-on poly better. Waterlox Original Tung-Oil Finish – this strikes me as quite similar to the Sutherland and Welles finish. I tried the high-gloss version of this. Other than being too glossy for me (yes, plastic-y despite being a “natural” finish), it worked fine. The dry time is not as good as the Minwax wipe-on urethane, and it’s expensive, so I don’t see a reason to use it over the Minwax. Rubio Monocoat – this is a new coating developed by a Belgian company and recently available in the U.S. The manufacturer makes pretty outlandish claims, mainly that this finish can be applied in a single wipe-on coat, and that it protects against water, etc. I ordered samples and tried it. Sorry…it doesn’t work as claimed. It does darken the wood somewhat, enhancing its appearance. It does not protect significantly against water based on my experience. It also has almost no sheen. It’s also ridiculously expensive. Skip this one. I realize this may come across as an ad for Minwax. They are a big player and have relatively refined, affordable products. Honestly, I think the reason some of the niche products survive is that there are lots of myths and superstitions about finishes, and because very few people try several different products side by side. In my opinion it is very hard to beat the mainstream options you can find in your hardware store. Fine Woodworking ran a nice test a few years back on these and other finishes. They came to similar conclusions. It is available here. If you want to read some some interesting descriptions of finishes by those who are really obsessive about them, check out these notes by Russ Fairfield on finishes. Thanks for the great summary. Please recommend a product for pine windows. We want to keep the natural pine color. My cabin has big windows with pine interiors that needed to be finished. I believe your best bet is Minwax Wipe-On Polyurethane. It is easy to apply and has tested very well. However, a potential concern is that if the wood is highly absorbent you have have a hard time getting enough on it to establish the finish and sheen you want. I found that with some of my clear vertical-grain fir, it took a lot of the poly to build up the sheen I wanted. Anyway, it’s really easy to test an out-of-the-way window and see how you like it. That poly is widely available, including at Home Depot. I found that the full-gloss version worked well on fir…never became too glossy.